Green-Venom-Tongue is an Argonian member of the Dark Brotherhood. He is also a Shadowscale. You will first meet Green-Venom-Tongue after you have gained access to the Sanctuary in the Gold Coast and meet your new family. As you will find out soon enough, Green-Venom-Tongue likes to record everything in his notes and spends considerable amount of time studying them. He sometimes (mis)interprets things that are said figuratively, and over-analyzes said things, which makes him appear as somewhat peculiar. Welcome Home: Introduce yourself to your new family. A Ghost from the Past: Accompany Green-Venom-Tongue on a journey to the past. The Wrath of Sithis: Ensure that the Black Hand's will is done at Knightsgrave. After completing Signed in Blood, Astara Caerellius will propose that you introduce yourself to other members of the Brotherhood. You will find Green-Venom-Tongue in the northern part of the Sanctuary where the living quarters are located. 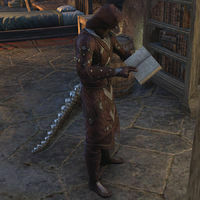 He is busy reading his notes, remarking, "Ah, I heard we had a new initiate on the premises! I was just checking my notes and realized that details concerning you are sorely lacking. We'll need to rectify that before too long." The Matron suggested I introduce myself. "She did? Interesting. I wonder what she's planning this time? Well, I'm certain everything will become clear eventually. Even you, I suppose." Why do they call you Green-Venom-Tongue? "Aren't you familiar with the cherished Black Marsh custom? Consuming various venomous concoctions to bolster our natural immunity? I drank so much my tongue turned green! Ha! The new initiates fall for that every time!" Anyway, it's nice to meet you. "And you, as well, Initiate. I look forward to interviewing you at length when you have some time. For my journals, of course. I keep meticulous records. I'll help you, you'll help me ... isn't that what the Bretons call a "win-win"? You then have the opportunity to ask a few more things from Green-Venom-Tongue. When you return to him, he will however be slightly confused, "I was almost certain that we had concluded our social interaction, but these customs have always confused me. Is there something else expected of us? An ever so brief embrace perhaps? Or the firm clasping of the wrists and hands?" I'd like to know a bit more about you. "What more could you possibly need to know? I am a Shadowscale. My life begins and ends with the Dark Brotherhood." "I could have sworn I explained this before. Let me check my notes. Hmmm. Well, like other Argonians born under the sign of the Shadow, I was taken upon hatching and trained to be an assassin. That makes me a good killer. A very good killer." "What an intriguing inquiry! Attempting to ascertain if I actually like it here or something more subtle? Well, like or dislike is meaningless. I serve the Matron as I served my former Sanctuary. And as I serve Black Marsh when called upon." "The river carries us where it will, and that's all I prefer to say about that at this time. I was there. Now I am here. As are you, Initiate." Is there actually something about me in that book? "Perhaps ... depending upon what you mean by "something" and "me." Rest assured, whatever musings and observations I record herein are strictly confidential." Any advice you want to share with a new recruit? "Now this one I know I've written down! Study the Five Tenets. Learn them, memorize them, live them. There's a copy in the Sanctuary. Someplace. I'd let you look at this one, but I don't let anybody read my journals. That would be ... inadvisable." I ... see. Anything else? "Such a curious mind! Then listen carefully, Initiate. Contracts must be taken seriously. Always obey the Matron's instructions to the letter. And don't get yourself killed. Though that probably goes without saying." After you have accepted the task from Astara, you can ask Green-Venom-Tongue briefly what he thinks. He will say, "Make no mistake, Initiate. Astara sends you to Kvatch not because she trusts you. She's decided to test you. Do not fail her." Any advice on my current mission? "An average priest is easy prey, but don't underestimate the Grand Sermonizer. I heard whispers that she's a highly trained spellcaster. If that turns out to be true, please let me know. I like to keep my records up to date." Any thoughts on the current situation? "I never question the Matron, although it's strange for her to so hastily send multiple brethren to deal with a single target. It's almost as though she knows more than she is telling us. Of course, she almost always does." Afterwards, Green-Venom-Tongue will commend you for the fulfilled task, saying, "A good showing, slaying the Grand Sermonizer. A pity Cimbar paid for his failure with his life. Keep your blades sharp and your wits sharper, otherwise we may see a similar end to your story. Even so, I've recorded it all. For posterity, of course." You weren't fond of Cimbar? "I felt no particular emotions concerning him whatsoever. Not all of us form attachments so easily." Is there anyone here you care about? "I care about performing my duties under the shadow of Sithis. That includes following the Tenets. I aid my Brothers and Sisters when I can. Beyond that ... I'd rather not say." Sounds like there's a story there. "For another time, perhaps. At present, I suggest you focus on your contracts. Take care getting too personal with your Brothers and Sisters. Attachments can become a ... distraction." When you talk to Green-Venom-Tongue after agreeing to help Kor, he will say, "You and the Nord seek the girl. Hmm. My research suggests she is a confused and tormented individual, prone to blaming herself when misfortune strikes. My conclusion? She's going to get herself killed." "It isn't? I'll make note of that. Perhaps this will be more useful—chasing after Hilde will likely result in your death as well." She's part of the family. Shouldn't we look out for each other? "Not once did I deny that. I simply set the facts at your feet. To act despite this knowledge ... would not be such a terrible thing." After you have helped Hildegard and Kor, talk to Green-Venom-Tongue who will comment, "First Tanek, now small Hildegard. I suppose if you were in league with the Black Dragon you would not have saved them. Interesting. Let me jot that down." Wait. You thought I was the one killing members of the family? "Is that so hard to believe? If I were hunting the Brotherhood, I would certainly attempt to infiltrate their ranks and destroy them from within." So have I earned your trust? "No one still living has my complete trust. I would advise you to walk a similar path in that regard. But I don't believe you're the killer. Not any more. But something makes my scales itch. Something I'm missing ...."
"Further research is required. I prefer not to act on a hunch. For now, let's continue to work our contracts and hope an opportunity to unmask the killer presents itself." When you talk to Green-Venom-Tongue he will share some of his thoughts on the matter with you, saying, "I don't know who Fortunata wants dead, but an educated guess isn't difficult. According to my notes, relations between Anvil and Kvatch have been strained, if not outright hostile, of late." "Governor Fortunata fears what all those in power fear—the loss of that power. She will no doubt seek to strike at someone she believes is key to the stability of Kvatch." So I'll likely be heading back to Kvatch. "Killing your target will likely be the least difficult aspect of the job. I suggest discretion. Alerting others will be the real threat, especially if you're tasked with infiltrating a fortified area, such as the castle." Talk to Green-Venom-Tongue when you have returned from Castle Anvil. He will comment, "An unexpected turn on your last mission. I admit, I would not have expected Count Carolus to have the will to perform the Black Sacrament. And now he owes us information as well as gold. Very interesting. We can always use both." "Please, Assassin, not now. I need to record that exchange between Mirabelle and the Matron word for word. Does 'cold-hearted oligarch' have one 'g' or two?" After the conclusion of the quest, Green-Venom-Tongue will be tasked with reading the Black Dragon's journal and search for clues. When spoken to, he will say, "The entries in this journal go back more than a decade. It will take some time to make sense of it all. Do not worry, Assassin. Whatever I learn from this tome, you'll be the first to know." Green: "I wonder, assassin: do you have a moment to consider a request?" "That journal you recovered. The contents are ... disturbingly intriguing. You reported that my old associate, Lyra Viria, is the Black Dragon. The journal, however, claims the Black Dragon killed Lyra. I need to determine the truth of this matter." Tell me about the Lyra you knew. "Lyra was the most skilled of my Brothers and Sisters. I assumed she died in the purification of my former Sanctuary, along with the rest of my old family. If the Black Dragon killed Lyra, why does she use her name? Curiouser and curiouser ...."
"I want to pretend I never read that journal, but I can't resist a mystery. The Black Dragon killed Lyra and destroyed my former Sanctuary, or Lyra is the Black Dragon. Either way, I need to know the truth. Will you come with me, Assassin?" "I'll arrange our transport to my former Sanctuary. Meet me near the gates of Anvil when you are ready to depart. And thank you, Assassin, for agreeing to help me." Where is your former Sanctuary, exactly? "Not far. Just over the border into Black Marsh, as a matter of fact. I haven't been back there in many years. I wonder what we'll find when we finally get there?" You said something about purification? "Purification. That's what they called it. I suppose the term is accurate. Betrayal and corruption festered in our ranks, though I'm not sure what the source was or why it happened. The Black Hand decreed that a systematic cleansing was the solution." Why weren't you killed in the purification? "Another excellent question. I'm going to record that for later. But as for the answer, I was working deep in Black Marsh during that season. Whatever the rest of my Sanctuary did to anger the Black Hand, it was obvious that I had no part in it." You're sure you want to return to your old Sanctuary? "I abhor a mystery. If I have to confront my past to shed light on the present, then so be it. At least I won't be alone. With you by my side, I am sure I can face whatever secret the purified Sanctuary may contain." Why would the Black Dragon use your friend's name? "Perhaps the Black Dragon took Lyra's name as some sort of trophy. Or maybe she adopted it to confuse us. Regardless, I thought Lyra perished along with the rest of my Brothers and Sisters. I thought I alone had been spared." You think the Black Dragon destroyed your old Sanctuary? "I'm not sure what to believe, but the Black Dragon certainly implies that in her journal. Whatever the case, only a master assassin could accomplish something as far-reaching as purification. The Black Dragon's skills clearly mark her as such." Does Astara know we're going to do this? "As much as I admire curiosity, sometimes your questions can be somewhat ... irritating. The Matron asked me to research the journal and give her a report. My research requires that we visit my former Sanctuary. All in the line of duty, as it were." Shouldn't we let her know where we're going? "Should I go and tell Astara that I'm taking her best recruit to a place the Dark Brotherhood destroyed and abandoned so that we can uncover the truth of the Black Dragon? Hmm. I'd say no. Let's not do that. She'll hear about it soon enough, anyway." Remind me, what's happened at the Sanctuary recently? "I sometimes forget the details myself, Assassin. That's one of the reasons I write everything down. You discovered that the Black Dragon is a member of the Order of the Hour, but the price for that knowledge was Mirabelle's life." I also found the Black Dragon's journal. "Which I have been studying in an attempt to determine what the true connection is between the Black Dragon and Lyra, the Sister I thought was killed in the purification. That's what I hope to uncover when we visit my former Sanctuary." "This horse and cart will get us to Blackwood, where Cyrodiil flows into Black Marsh. Climb aboard when you are ready. We can wait if we still have things to do before you depart." What do we do after we get to Blackwood? "You ask the most interesting questions. Let me jot that down. After we get to Blackwood, Shazara-Ta will take us up the river to Sanctuary [sic]. Don't worry. Shazara-Ta's an excellent boat handler. She knows those rivers like the tip of her tail." "She's a Black Marsh tracker who I've had the pleasure to work with in the past. We can trust her implicitly. Besides, she has the most enticing fascination with all things Shadowscale. You'd think I'd find that annoying, but not in the least." Green: "I haven't walked these marshes in a long, long time. Strange, but it doesn't feel like coming home." Green: "I never was able to learn much about the purification. Even the Listener refused to talk about it." Green: "She did say that the Black Hand can call for purification in extreme circumstances. I just wish I knew what made the purge necessary." Green: "This time, though, I think we'll learn something I never knew. At least, I hope we will." Green: "Keep your eyes open. The Sanctuary may be abandoned, but such places never stay quiet for long. Let us go inside." Green: "Ah, the Black Door. Still intact after all these years. No worries. I remember the proper reply." Black Door: "What... is the gift... of death?" "Have you ever seen as the Hist sees? Have you ever looked beyond the barrier of time? We're going to see with more than our eyes to find the truth in this place." "Another excellent question! Keep them coming, Assassin! I believe in preparing for every contingency. So I brought along this resin. When burned, its fumes reveal things that are hidden from our feeble eyes." "Can't you sense it? We're not alone in here. I'll need you to deal with anything that tries to stop us while I keep the flame burning." "Didn't I explain that already? Let me check my notes. Hmm. Interesting. The Sanctuary was abandoned by the living, yes, but it still holds many dark secrets. Secrets even the resin may not reveal. We should be on our guard." "Then let me light the flame. Breathe deep and let the resin open your eyes. It might be uncomfortable, but I urge you not to resist. The effects should be temporary, in all likelihood. Let the fumes lead us to the answers we seek." "Truth tries to hide in plain sight and is often most elusive when you actively seek it. The resin fumes provide an advantage in this regard. Let them fill you so that you can truly see. Spread out and search for anything out of the ordinary." "This place retains memories like my journals hold recollections. Everything we see happened. It seems Lyra did carry out the purification. Let's press on. We must see everything while the resin still burns." Green-Venom-Tongue has four lines spoken outside of the dialogue interface, without subtitles, when you first approach each of the four skeletons left in the Sanctuary. He also utters remarks after each memory. "When the Black Hand sealed the Sanctuary, I had no idea they left the bodies where they fell. Let's see what the resin reveals." "More remains... Another dead associate; another piece of this sorry puzzle." "Clarity blooms through the fog of the Hist. But to be charged with such a terrible task..."
"Walking these halls reminds me of the story they used to tell to scare the initiates... The tale of the wrath of Sithis." "In the old stories, the wrath of Sithis appeared to carry away the souls of traitors. If that's true, I wonder why purification was even necessary." "Another set of remains. I hope this is the last." "She completed the purification of her own Sanctuary. I can't even imagine what that must have done to her." "How terrible. Lyra was ordered to purify her own Sanctuary. To kill her own Brothers and Sisters. I never even imagined ...."
What do you think all this means? "It means I was kept in the dark about the purification. I understand why they thought that was necessary, but it doesn't change the fact that I had to learn the truth on my own. Lyra didn't die in the purge—she was the Black Hand's sword." But what happened after that? And what's the connection between Lyra and the Black Dragon? "That still eludes me. Obviously, the Black Dragon wants us to believe that she and Lyra are one and the same. But I can't imagine Lyra turning her back on the Night Mother, on Sithis. There is a piece missing from this puzzle, I just know it." So how do we find this missing piece of the puzzle? "After Lyra completed the purification, she would have gone to the shrine of Sithis to make an offering and pray over her success. It was her usual ritual. Let's visit the shrine and see if any images remain of that moment in time." When you approach the shrine, he says, "Look! I was right. There is another memory to see." "Well, wasn't that revealing! I might have to find other uses for these wonderful fumes! It appears that not only did Lyra complete the purification of our old Sanctuary as she was commanded, but she also took on another contract when she was done." I saw. But who's Primate Jonas? "Before his grandness Artorius ascended to the top of the religious hierarchy, Primate Jonas was the tip of the tower as far as Akatosh's followers were concerned. There were rumors, but this proves that Jonas didn't succumb to natural causes." But why is Lyra working for the Order of the Hour now? "An excellent question! If the Black Dragon really is Lyra, I'll kill the traitor myself! Meet me in Kvatch, Assassin. I have a little resin remaining. With it, we might be able to determine what occurred during Lyra's final contract." As he departs the Sanctuary, he says, "Shazara-Ta will return you to the Gold Coast. I'll meet you in front of Akatosh's Cathedral in Kvatch — after I pay my respects to these... memories." "I can't explain it, but I have a feeling that this is the place. Perhaps a residual effect of breathing so much of the fumes? I've only enough resin left for a few more precious seconds, so let's hope I'm right about this location." "Then breathe deep of the resin's fumes one last time. Let's see if we can learn the fate of my lost Sister, Lyra." "The visions don't lie. The fumes confirmed my worst fears. Lyra abandoned the Dark Brotherhood and became the Black Dragon. She betrayed us all." I know you were hoping we were wrong about Lyra. "Lyra Viria died the day the Black Dragon was born, just as the journal said. My friend is gone. All that remains is another enemy of the Dark Brotherhood. An enemy that will die by my hand." It sounds like the Black Dragon serves Primate Artorius. "And that's information we need to convey to Astara. Servant and master both need to be dropped into the Void for daring to strike against us." As he departs Kvatch, he tells you, "Let's return to the Sanctuary and tell Astara what the fumes revealed. I'll meet you there." Astara: "Of course I knew. If I didn't intend for that to happen, you'd be a backpack by now. Tell me what you uncovered." Green: "All evidence points to one conclusion: Lyra is the Black Dragon, and she's working for Primate Artorius." Astara: "The Black Dragon was one of us? She knows how we think, how we act. Artorius uses our own weapon against us!" Green: "Give me the order, Matron. Let my blade be the one that ends the Black Dragon's life." Astara: "Patience, brother. Let me consider the ramifications. Your connection to Lyra could be a boon in this matter, but it could also be a detriment." This page was last modified on 20 June 2018, at 03:11.